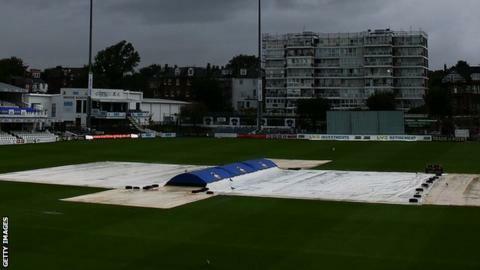 Sussex's game against Championship leaders Yorkshire ended in a draw after the final day's play was abandoned because of rain at Hove. Umpires Neil Bainton and Peter Hartley took the decision to call off the match shortly after 12:00 BST. A draw had seemed inevitable, in any event, with Sussex set to resume on 493-7 in reply to Yorkshire's 494. The visitors took 11 points from the game, moving them closer to a second successive county title. Middlesex's victory against Durham cut the Tykes' lead to 30 points, but Yorkshire have a game in hand and now need a maximum of 43 from their four remaining fixtures to become champions again. The White Rose county now host Somerset at Headingley (1-4 September), followed by a trip to play Middlesex at Lord's, starting the following week on 9 September. "Sussex came out and played really aggressively. That was good, but we just got away from our plan a little bit. "You could tell that, with the amount of runs scored square of the wicket, it suggests we bowled a little bit short and a little bit wide at times, so we didn't adapt. "We got away from our focus which was to pitch the ball up and look to hit the off stump. We'll take the 11 points from this game, but we can't look any further ahead than our next challenge." "There were a lot of positives for us. "Three of our batsmen got hundreds and we now have a good week to prepare for a big game against Worcestershire."